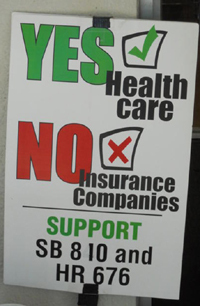 South Bay residents seek answers to health care crisis. Liz Gonzalez with Voluntarios de la Comunidad. tells what the recently passed national health plan does and does not offer immigrants, and Mary Quintin. who works in a dental office, reveals the tricks insurance companies play to delay or avoid paying claims. Santa Clara County Single Payer Coalition 408-977-1275 meets at the Low Income Self Help Center, 1875 West Alma Street, San Jose. Health Care for All California meets in Santa Clara. Call 650-322-6909 for date and location. This edition of 48south7th.org is sponsored by Health Care for All California - Silicon Valley, a community partner of San Jose Peace & Justice Center.